COB Calais' youth sides have, in the last two seasons, done well in cup competitions. When you review the team sheet, you will notice that 7 players were involved in the U18 cup last season. The players have grown up together over the last few years. When they play to their maximum potential they are a very tough team to beat. In their match with Le Havre, Calais already had a 7-point head start. Within two minutes of the start of the game they added 9 points (16-0). By the end of the first period Calais had increased their advantage to (32-14). Calais' free run continued in the second quarter and by the interval they led by 23 points (56-23). Pauline Machu for Calais was having a good game at both ends of the court leading the score boards with 21 points. Calais continued to dominate (83-49) after 34 minutes. Le Havre had the better of the last six minutes and reduced their deficit. Yet it was the young team from Calais who walked away with the victory (89-67). In the north of France there is also another knock-out-competition called the "Trophée Gilberte Delcambre". On Tuesday evening the COB Calais Espoir were beaten (25 March) by Villeneuve Espoir (67-72). The SIG had a potentially tricky match against Sainte-Sevine (NF3). The SIG women made up their 7-point handicap to take the lead after four minutes (11-9). Playing at home helped and by the end of the first period the SIG had already put 14 points between themselves and their guests (30-16). The second quarter was error written and best forgotten as the game became stale. Whereas in the third period the difference in divisions between the two sides started to become apparent: The SIG took command before finishing their opponents off in the final period to win (83-51). AS Villeurbanne were not in a charitable mood with Geispolsheim and took six minutes to draw level. By the interval they had the game wrapped up (51-25). The second half of the match was one-way traffic with Villeurbanne winning comfortably (98-43). For the first time they are now in the quarter-final. In one of the more exiting ties, home side Basket Val de Loire Union 37 (BLVU) ran out of time as they fell (69-72) to Stade Poitevin Basketball. Adriana Cavojska scored 32 points in a losing cause while Pauline Rimbaud led the way with 22 points. She was helped by Kristina Karklina who scored 21 points for the visitors. ATB 79 Paris dreams were shattered by the trophée Coupe de France defending champions Ouistrehem (68-60). In a match full of passion it was not until the third period that Ouistreham on the back of an 11-0 run managed to take hold of the game. ATB suffered a big blow with the loss of Emméline Mary in the third period by a serious injury. Still ATB made a game of it in the final period. Despite the efforts of Noémie Charrier who scored 27 points they ran out of time. In the three other games played last weekend US Laveyron rolled over Aix-en-Provence Espoir (78-49) while Nice Côte d'Azur beat Toulouse (108-89). 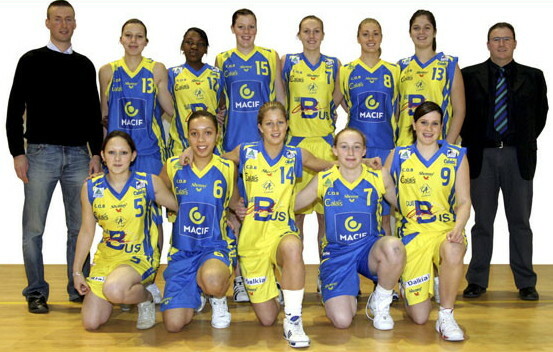 CSP Rezé experience was enough for them to see off La Rochelle (74-54).